After the arrival of the Sisters of the Holy Names of Jesus and Mary in Winnipeg in 1874, they branched out to other parts of Manitoba. This building, the oldest rural convent in the province, was constructed in 1897–98 to designs prepared by J.A. Sénécal, a prominent St. Boniface architect and contractor. A north wing designed by Sénécal and J.A. Hudon was added in 1910. 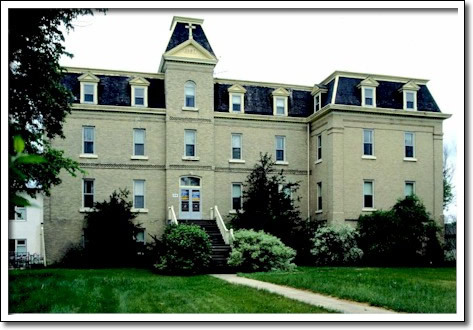 In Manitoba’s Francophone communities, the convent was often the principal educational institution for youth of the district. Together with the local Catholic church, the convent was a prominent social centre through which the French language and culture flourished. It served as a residence and infirmary for the convent, a girls’ boarding and day school, music school, and a centre for senior citizens’ activities. The former St. Jean-Baptiste convent is an excellent example of Second Empire architecture, a style used extensively by the French Catholic religious community in Manitoba. The building incorporates all the distinguishing features of the style—a mansard roof, dormer windows, decorative brick detailing, and a central pavilion.